ROLPA, Dec 16: Nepotism has been rampant in the CPN (Maoist Center) in Rolpa and Rukum districts, the cradle of the decade-long Maoist insurgency that started in 1996 demanding restructuring of the state. Even senior Maoist leaders have been lobbying for putting their relatives and near and dear ones in political positions. Influential Maoist leaders Krishna Bahadur Mahara, Barshaman Pun and Janardan Sharma have been promoting their relatives in political positions in recent years. Maoist leader Barshaman Pun is in the forefront when it comes to favoring relatives for political positions. Pun’s sister Man Kumari Gharti was elected the deputy mayor of Rolpa Municipality in the local poll. Another of his sister Lal Kumari Pun was also elected to the provincial assembly from Lalitpur-1a in the recent polls. In addition to getting elected as a Member of Parliament from Rolpa, Pun has succeeded in including his wife Onsari Gharti in the proportional representation (PR) for the federal parliament. Likewise, former finance minister Krishna Bahadur Mahara has been successful in getting his son-in-law Purna KC elected as the mayor of Ropla Municipality. Mahara was elected to the federal parliament from Dang-2 in the recent election. 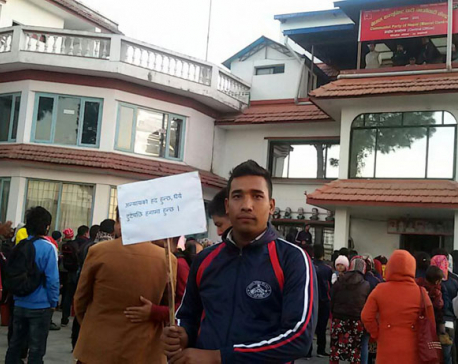 Also, Maoist leader Kul Prasad KC has been elected to the provincial assembly member from Rolpa (a). His wife Tara Gharti is in the PR candidate list from the Maoist Party. The case of Rukum district is similar. Purna Gharti who was elected to the provincial assembly has enlisted his wife Sita Acharya as PR candidate from Rolpa district. Likewise, Kamala Roka who has been elected as a parliament member is the wife of former Maoist minister Ganesh Man Pun. Former minister Janardan Sharma, who has been elected as parliament member from Rukum west had lobbied for the candidacy of his brother Anil Sharma from Kathmandu-1. However, Sharma was defeated. Likewise, the elder brother of Gopal Sharma who was elected a provincial assembly member from Rukum west (b) is the mayor of Chaurjhari Municipality of Rukum. Similarly, Gita Nepali, the daughter of provincial assembly member elect from Rukum west (a), Rato Kami, is the deputy mayor of Aathbiskot Municipality of the district. Wife of Tej Bahadur Oli, who has been elected to the provincial assembly from Rukum east (a) has succeeded in enlisting his wife Junkumari Roka as a PR candidate for federal parliament. Likewise, the mayors of Musikot and Aathbiskot municipalities of the district are father-in-law and son-in-law to each other.